Neighbors surrounding the Ox Ridge Hunt Club have made efforts to meet with the club's board of stewards to discuss the potential plan for a cellphone tower, but to no avail. As a result, they have created a petition on Change.org, which has garnered more than 190 signatures as of Wednesday. The petition lists five reasons for the neighbors' opposition to the proposed 120-foot-high cell "silo" at the club near the corner of Middlesex and Saddle Ridge roads. "While not officially designated as having historical significance by the State Historical Preservation Office, ORHC is one of the oldest and most highly regarded equestrian facilities in the United States," the petition said. "That reputation will undoubtedly be compromised by the existence of the proposed cell tower." The petition also lists decreased property values; the threat to the health and well-being of the hunt club staff, members and horses; the construction of a "silo" on a property that is not a farm; and that the revenue the hunt club will generate from AT&T does not outweigh the "costs" outlined in the petition. 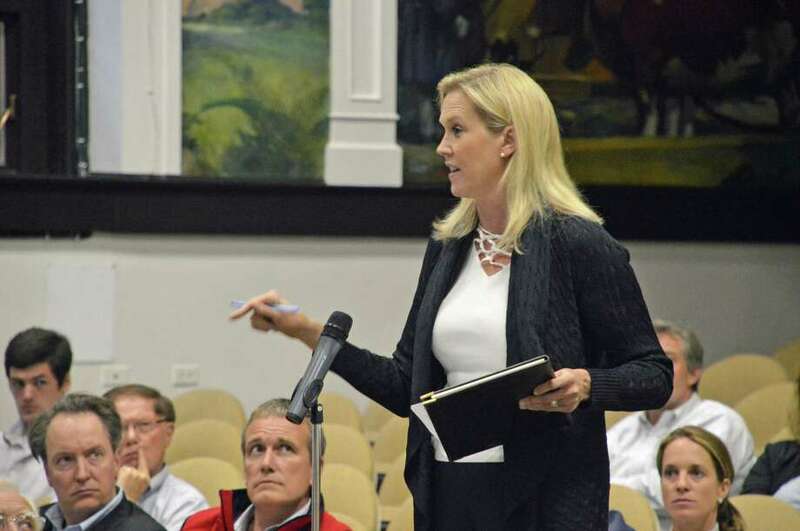 The Ox Ridge Hunt Club is one of the landmark "anchors" of Darien and a cell tower on its grounds would compromise its existence and stature," wrote Debra McArthur, one of the signers of the petition. "Not to mention the negative financial impact to the neighboring single family property values." Susan Knapp, vice president of the board of stewards, said she had not heard of the petition. "I really think who they should be speaking to is AT&T," Knapp said. "We don't have the answers that they would want to hear." James Buchanan, the president of the board, could not be reached for comment. "The height and placement of this cell tower creates visual pollution in our bucolic neighborhood," wrote Patricia Bumgardner. An informational meeting hosted by AT&T May 22 drew about 50 Darienites, many of whom voiced their displeasure with the proposed tower. "I'm very concerned with the impact on property values," said Jenny Schwartz, who lives on Saddle Ridge and is helping to mobilize neighbors against the project. "That property is a draw," she said of Ox Ridge. "It's one of those things that distinguishes Darien." "I think you'll deface it," she said. "I think you'll ruin it and I think you'll kill the neighborhood." AT&T representatives, however, said tower was necessary because of burgeoning network use. They said data, not voice, was where the greatest need was due to ever-increasing use, and that service will begin to decline if a tower isn't erected. "The problem in this day and age ... is that the data increase on the network is increasing exponentially," Harry Carey, director of external affairs for AT&T, said. "It's really this increased data capability within the home that is our intention." He said more and more people are working from home, thus putting a greater strain on equipment. "Most people have multiple devices now," Chris Fisher, a consulting attorney for AT&T, said, noting the company anticipates in the next few years that every individual will have six or seven devices requiring a connection. "It's a pretty pronounced curve," he said of the industry growth. "In order to keep up with that demand, that's where infrastructure has to be built." Regardless, people argued against it, sometimes getting very emotional. "This is not a necessity," David Upson said. "This is not required to live. You do not need the ability to make a phone call ... going from the top of Darien to the bottom of Darien ... It doesn't make sense to me." "I want to understand who was really asking for this," he said. "Why are you projecting a gap when no one is complaining about a gap ... Are people coming to you and saying they can't use your service?" Anthony Wells, managing partner with C2 Systems and an AT&T consultant, responded, "If we wait to address this until the network falls apart ... it'll be too late to address this. There is certainly a gap ... And the demand is increasing significantly every year, and not just on the data service, but the voice as well." Fisher explained that no applications have been submitted to the Connecticut Siting Council yet and won't be before the end of June. "We're in this phase which is called municipal consultation," he said. "We're really here to gather feedback and present facts to you as well about this particular proposal. "In some cases, as part of this process, we identify alternatives that the community might find more appropriate," he said, adding, "Sometimes those alternatives don't work out ... and we move forward with a formal application." He and others said several sites had been considered, but this one appeared most practical, in part because Ox Ridge expressed an interest in entering into a land lease agreement. "They would not let AT&T build a traditional tower pole, (so) this project progressed quickly to a silo design," Fisher said, sharing slides of what the slender red tower might look like from a variety of locations in the area. "We feel it's a design that is keeping with the vernacular of the property," Carey said. Leelee Klein, the closest neighbor on Saddle Ridge to the proposed site, said, "The last picture that you showed, that's the bottom of my driveway." She began crying during a brief speech in which she pleaded with the officials to not move forward with the project. "This tower is going 120 feet up just 100 yards from my house ... This tower is going to cast a shadow on my neighborhood. My neighborhood is beautiful. You are taking the beauty away," she said. "You're hurting our whole town," she said, drawing applause from the audience. "Please don't ruin our town." A full copy of the AT&T technical report is available through the town's website, www.darienct.gov.